After a busy season out in the meadows looking at plants, and once a month looking for bees, it is now time to slow down as the hay is now being cut on sites around the country and we can no longer sensibly visit sites (nothing to see here! ), I now have time to start actually thinking about some of the stuff we have been up to. Entering data from the fritillary counts has prompted me to think about our Flight of the Fritillary winter workshop, which we held in Cricklade last winter. This workshop is an opportunity to compile data from the previous years' fritillary counts and the monthly bumblebee surveys that we do on our three count sites (Lugg Meadows, Herefordshire, North meadow and Clattinger Farm, Wiltshire), with a very excellent group of volunteer surveyors. 1. Clattinger Farm recorded 10 species throughout the season. This is higher than the national average of 5-6 species. 3 species of cuckoo bumblebee were recorded, which shows there is a healthy population of both bumblebee and cuckoos, which indicates a healthy meadow. Cuckoo bees are parasites of bumbles so, it would be expected to see both where the populations are stable. 2. North Meadow - the emergence of bees in 2013 was very late (June), but in 2014-15 there were good (above average) numbers of bee species, along with again, 3 species of cuckoo bees. 3. Finally on the Lugg Meadows, a poor 2013, contrasted to a good year in 2014. 4 species of cuckoo bee have been recorded on this meadow along with a rare bumblebee (Bombus ruderarius, red shanked carder). The data from the Lugg suggest therefore that there is a lot of high quality grassland in the vicintiy and a better overall area for bees. In 2016, we have again been surveying these three sites. At Clattinger Farm in June, we counted nearly 100 bumblebees, with all 7 main species recorded and 1 cuckoo. 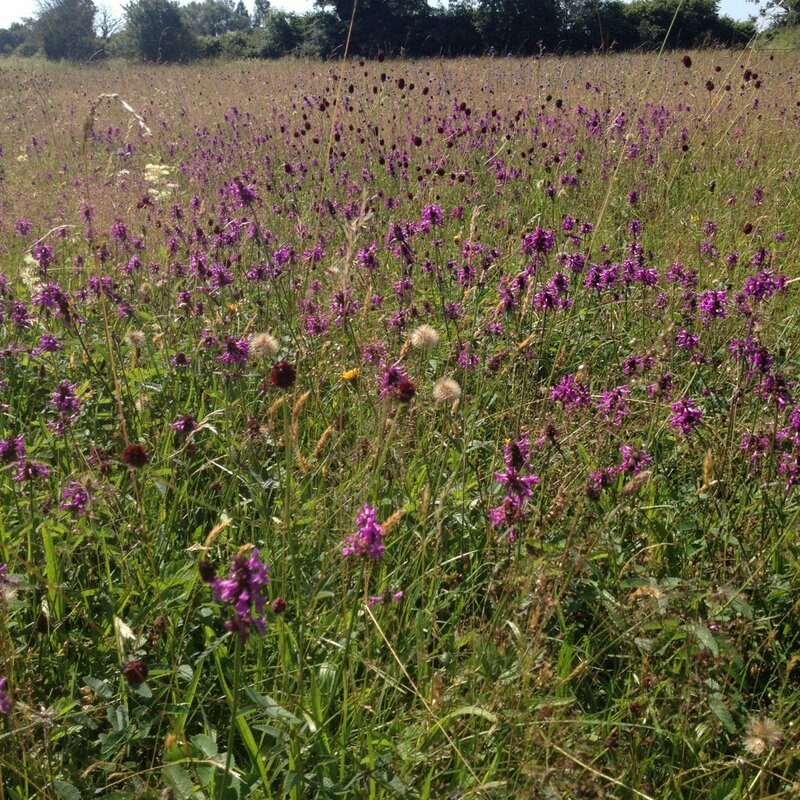 At North Meadow, in just 3 sections, the volunteers counted 400 bees! Yesterday at Clattinger however, for the July survey, we counted just 7 bees! Is it too hot for them currently? In June, Clattinger was all yellow flowers, with loads of hawkbit and yellow rattle, wheras yesterday, it was all purple - betony, devil's bit scabious and some knapweed (see below). As part of the Bee Walk survey method, we record flower species that bees are seen on, so hopefully as the data becomes more extensive, there may be trends and patterns here too. We will be looking at the fritillary data from 2016 soon, and also looking at pollination sucess, as we also counted fritillary pods in June this year, and trialled a small pollinator study at North Meadow. It is fascinating to be part of this long term study, looking at fritillaries and the relationship with bees, and to be working both with volunteers and academics, learning together about the trends we are observing. If you want to be part of our annual fritillary counts, or join us for monthly bee surveys, please get in touch.